We want to connect you to the best tools & resources as you gear up for next tax season. Just like TheTaxBook can save you time looking for the right answers, Accountant Connect℠ makes you and your practice more efficient by connecting you to your ADP client data and useful practice management tools in one simplified dashboard. Refer a new client to ADP and enter for a chance to secure your free copy of TheTaxBook for 2018. Simply fill out the form on this page today! 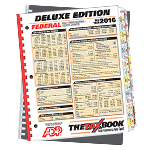 Your local ADP sales representative will be hand-delivering your access to TheTaxBook and will work with you to help identify clients we can assist in the new year. The ADP logo, ADP and ADP A more human resource are registered trademarks of ADP, LLC. All other marks are the property of their respective owners. Copyright © 2017 ADP, LLC. ALL RIGHTS RESERVED. All other marks belong to their owner.